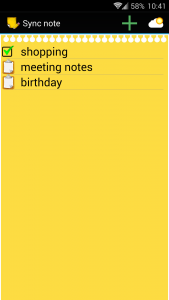 Save your notes and checklists in the cloud. That way, if you need to upgrade or erase your device memory, you will not loose any of your notes. This is the end of backup (at least for your notes 😉 ! 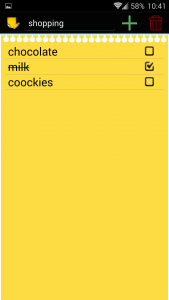 Synchronize your notes over multiple devices (smartphone, tablet, …) running Android (I’m also working on an app for Firefox OS). What’s great is that for theses two features you won’t need to create an account or do any other boring/complicated thing. For backup to cloud you don’t need to do anything, for synchronization you just need to enter a simple code on one of your device and it’s done, notes and checklist get synchronized !